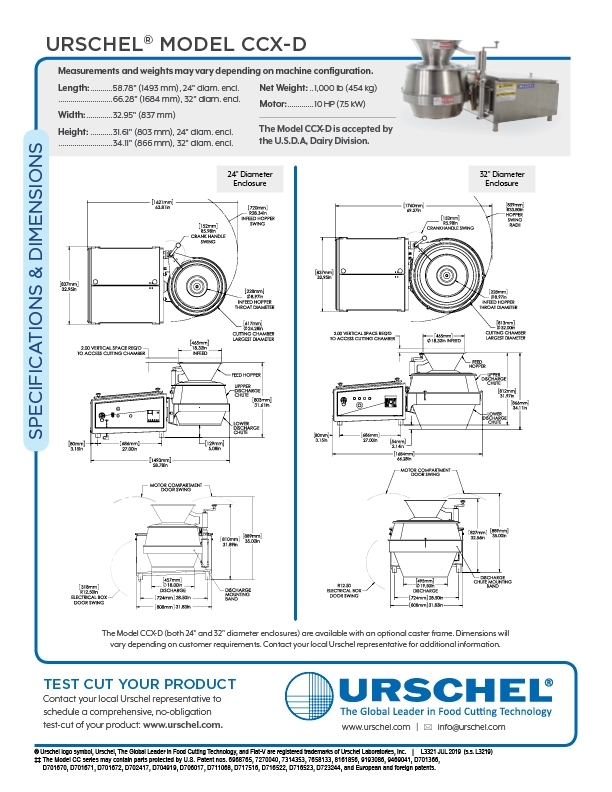 Model CCX-D Shredder - Urschel Laboratories, Inc. Similar to the CC-DL cheese grating machine, this model features several characteristics for easy and efficient slicing of dairy products. 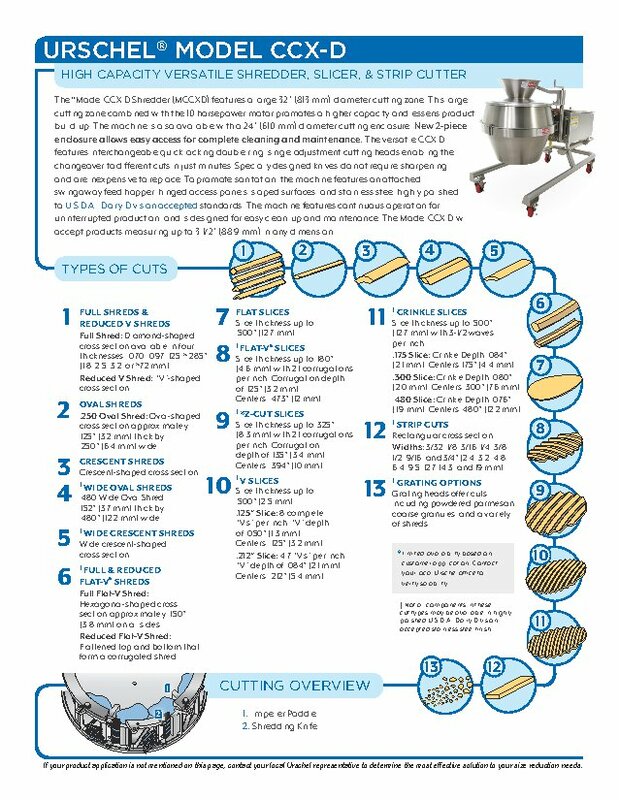 The Model CCX-D uniformly produces several different types of cuts including New Grating Options, Oval Shreds, Full Shreds, "V” Shreds, Flat-V™ Shreds, Crescent Shreds, and a wide variety of slices. 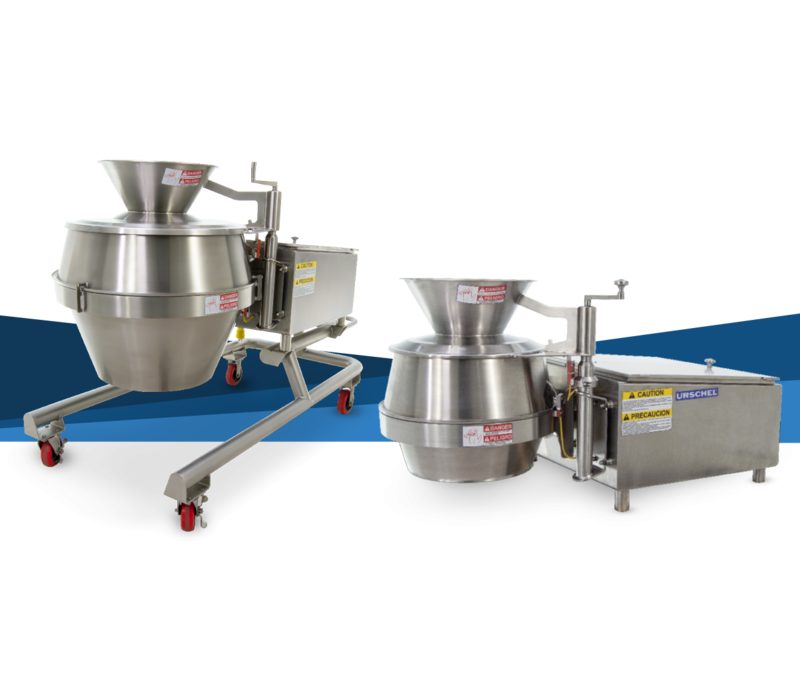 To promote sanitation, the machine features an attached swingaway feed hopper, hinged access panels, sloped surfaces, and stainless steel highly polished to U.S.D.A., Dairy Division accepted standards. Features interchangeable quick locking double ring, single adjustment cutting heads enabling the changeover to different cuts in just minutes. Specially designed knives do not require sharpening, and are inexpensive to replace. New 2-piece enclosure allows easy access for complete cleaning and maintenance. Features a large 32" (813 mm) diameter cutting zone. 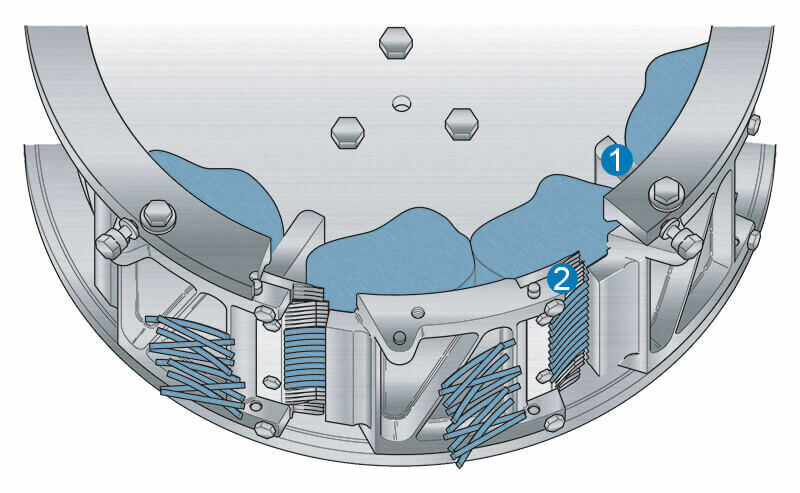 The 10 HP (7.5 kW) motor promotes a higher capacity and lessens product build-up. The machine is also available with a 24" (610 mm) diameter cutting enclosure. The Model CCX-D will accept products measuring up to 3-1/2" (89 mm) in any dimension. The Model CCX-D Shredder features a large 32" (813 mm) diameter cutting zone. This large cutting zone combined with the 10-horsepower motor promotes a higher capacity and lessens product build-up. The machine is also available with a 24" (610 mm) diameter cutting enclosure. New 2-piece enclosure allows easy access for complete cleaning and maintenance. The versatile CCX-D features interchangeable quick locking double ring, single adjustment cutting heads enabling the changeover to different cuts in just minutes. Specially designed knives do not require sharpening and are inexpensive to replace. To promote sanitation, the machine features an attached swing-away feed hopper, hinged access panels, sloped surfaces, and stainless steel highly polished to U.S.D.A., Dairy Division accepted standards. The machine features continuous operation for uninterrupted production and is designed for easy clean-up and maintenance. The Model CCX-D will accept products measuring up to 3-1/2" (88.9 mm) in any dimension. 58.78" (1493 mm) - 24" diam. encl. 66.28" (1684 mm) - 32" diam. encl. 31.61" (803 mm) - 24" diam. encl. 34.11" (866 mm) - 32" diam. encl.